I graduated from the fifth grade last Thursday. 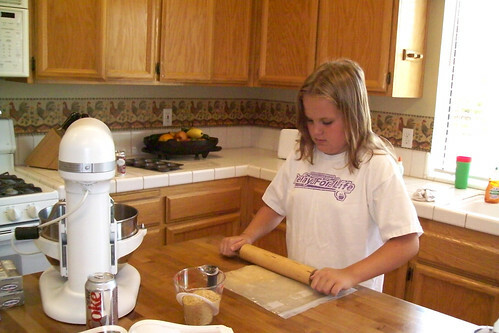 School’s out for the whole summer and I hope to get a lot of cooking time in. I’m hoping to make a German Chocolate Cake for Papa (Patty can help), Cream Puffs with Katy and a Black Forest Cake with Mary. I found this recipe in a real cool recipe book with the BEST recipes. It’s called “The Treasures of Christmas” but I’m using summer ingredients to dress them up. You may be surprised to hear that I made these all by myself – mom (Wanda) just showed me two little tips. I took the pictures too – except for the ones of myself – silly! Preheat oven to 300 degree. 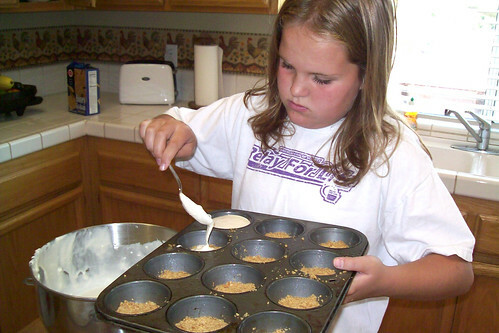 Combine crumbs, sugar and margarine; press equal portions onto bottoms of 24 lightly greased muffin cups. In large bowl, beat cream cheese until fluffy. Gradually beat in sweetened condensed milk until smooth. Add eggs and vanilla, mix well. Spoon equal amounts of mixture into prepared cups. Bake 20 min or until cakes spring back when lightly touched. Cool. Chill. Garnish as desired. *place in freezer for 15 min they will come out of the tins easier. I used fresh fruits, strawberries, blueberries and blackberries. I was lucky enough to taste them and they are as yummy as they look!! Oh boy, those look good! I can hardly wait for you to get here so you can make some for us!!! 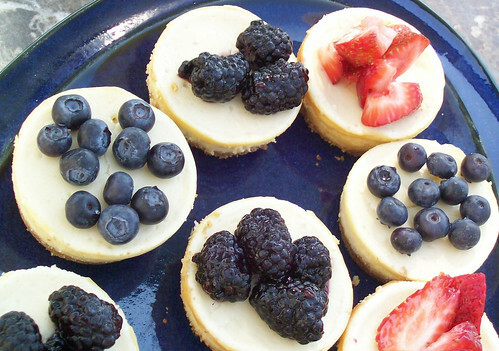 Your cheesecakes look fantastic!!!! I am going to make them with my niece this weekend. Her daddy loooovvves cheesecake. I live in Stockton not far from your family. Have a great time cooking this summer. 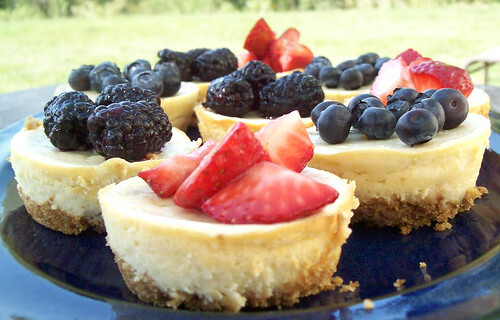 Hey Lisa – I forwarded your message on to Emma – she thinks you should make them because they are soooo good. Hope you did and enjoyed them! They look so delicious and sound so easy to make, don’t know why I haven’t done it before. My daughter will have a ball helping me. She likes to pretend she’s a chef. Did you put them in cupcake paper cases??? ?